Drum Corps International received two awards at the 51st annual International Festivals & Events Association (IFEA) Convention & Expo this week in Ottawa, Ont., Canada. IFEA is a nonprofit professional association for festival and event producers, suppliers and managers. The organization bills itself as the "premier professional association supporting festival and event leaders worldwide." IFEA's Pinnacle Awards recognize organizations in several award categories including promotional advertisements, merchandise, and sponsorships, among others. 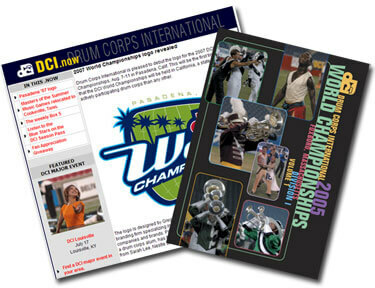 DCI won a bronze award for the "Best Event/Organization E-Newsletter" in the under $250,000 category for its weekly, DCI.now e-mail broadcasts, and received a silver award for "Best Event Video (for sale)" in the over $1.5 million category for its 2005 World Championship DVD products. "It's an honor to be recognized on this level along with other leaders in the event industry like the Kentucky Derby Festival, Pasadena Tournament of Roses Association and Walt Disney World," said Ed Dempsey, Drum Corps International's manager of strategic alliances. Dempsey accepted the awards on behalf of DCI at the IFEA convention. View a complete list of award winners in all categories on www.ifea.com.